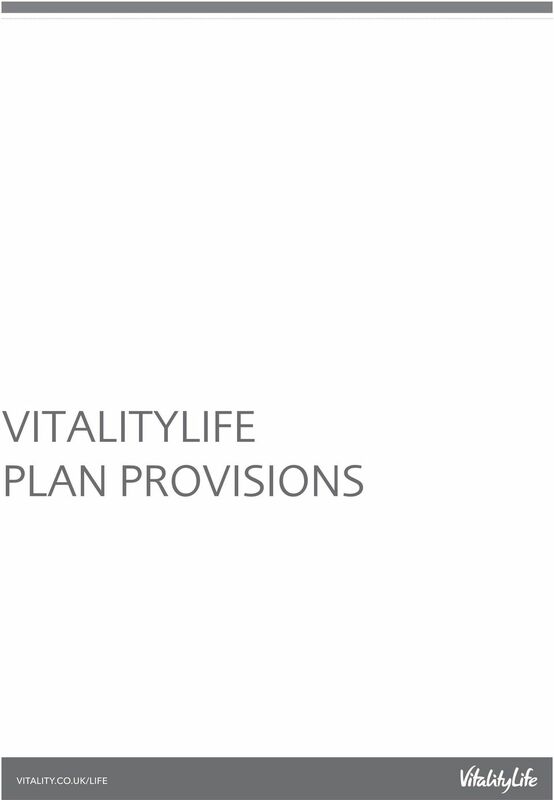 Download "VITALITYLIFE PLAN PROVISIONS VITALITY.CO.UK/LIFE"
3 VitalityLife Plan Provisions This document is your plan provisions. It explains how your plan works. 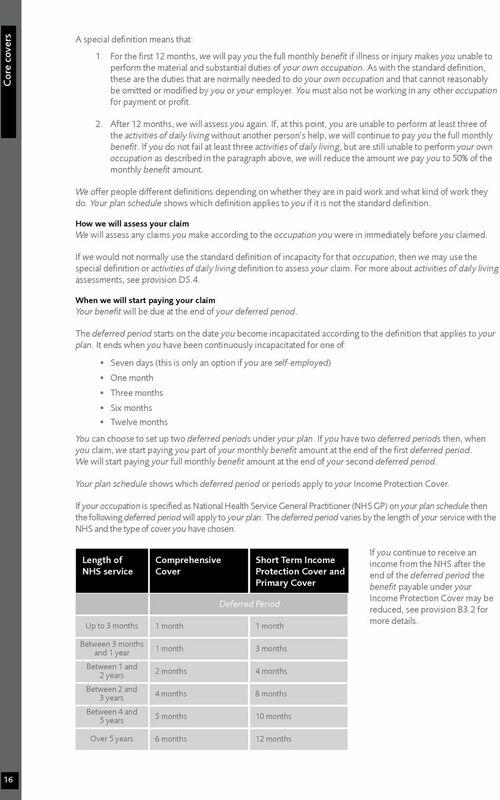 It includes details about the covers and options in the plan, how you pay your plan premiums, and how to make a claim if you need to. It explains how taking steps to improve your health can reduce your plan premium. If there is anything that is not clear, please speak to your financial adviser, if you have one. Or you can call us on If you call us, please have your plan number to hand. To help us improve our service, we may record or monitor phone conversations with you. In these provisions, we, us or our, means The Prudential Assurance Company Limited. 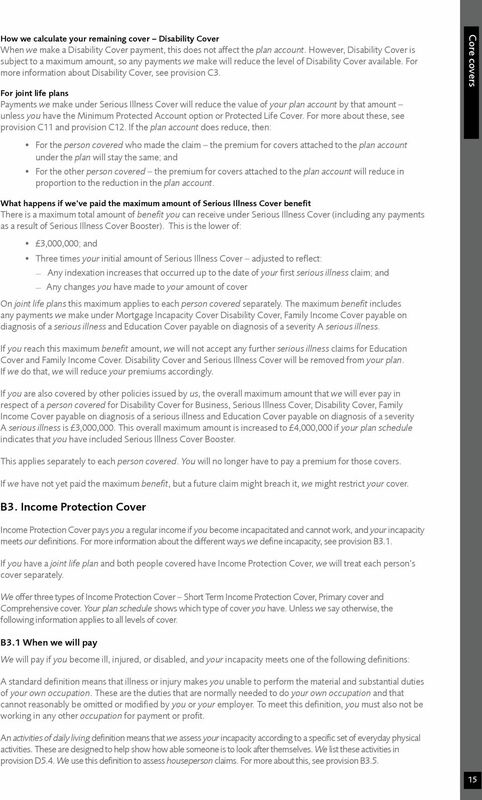 You or your means the person or people covered under the plan, unless stated otherwise. We have put some other words in italics. We explain what we mean by these words in the Definitions section. PLEASE CONTACT US ON OR SPEAK TO YOUR ADVISER IF YOU WOULD LIKE THIS DOCUMENT IN LARGE PRINT OR BRAILLE. 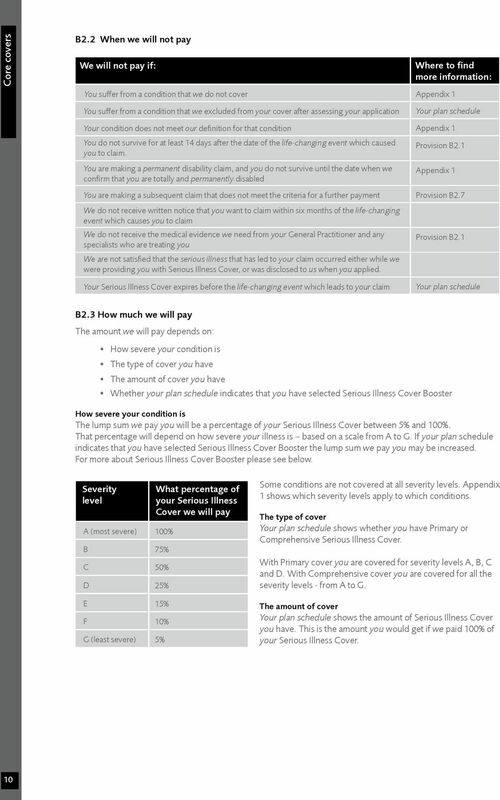 10 Core covers There are two severity levels; Severity Level What percentage of your amount of LifestyleCare Cover we will pay Level 1 20% Level 2 100% Appendix 4 shows which conditions are covered under Severity Level 1 and Severity Level 2. B1.5.3 When we will not pay We will not pay the benefit for LifestyleCare Cover if: You suffer from a condition that we do not cover You suffer from a condition that we excluded from your cover after assessing your application Your condition does not meet our definition for that condition You are making a subsequent claim that does not meet the criteria for a further payment We do not receive written notice that you want to claim within six months of the life-changing event which causes you to claim We do not receive the medical evidence we need from your General Practitioner and any appropriate medical specialists who are treating you We believe the condition that led to your claim was one you were already experiencing before your plan started and which you should have disclosed to us when you first applied You have selected LifestyleCare Cover Protector, and you do not survive for at least 14 days after the date that you meet a severity level 2 definition. 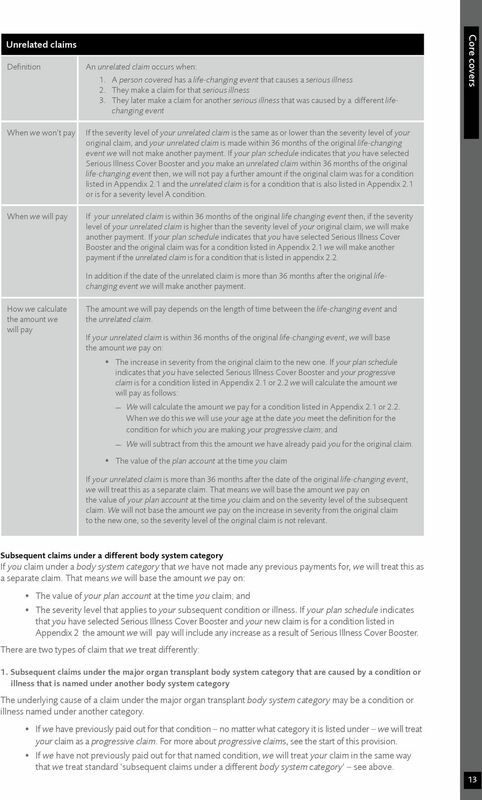 B1.5.4 What happens if you need to make a subsequent claim We will only make one Severity Level 1 payment. If we have paid you a claim under Severity Level 1 you can make a subsequent claim for a Severity Level 2 condition. This can be for the same condition, or a different one. For the subsequent Severity Level 2 condition, we will pay the remaining amount of your LifestyleCare Cover. 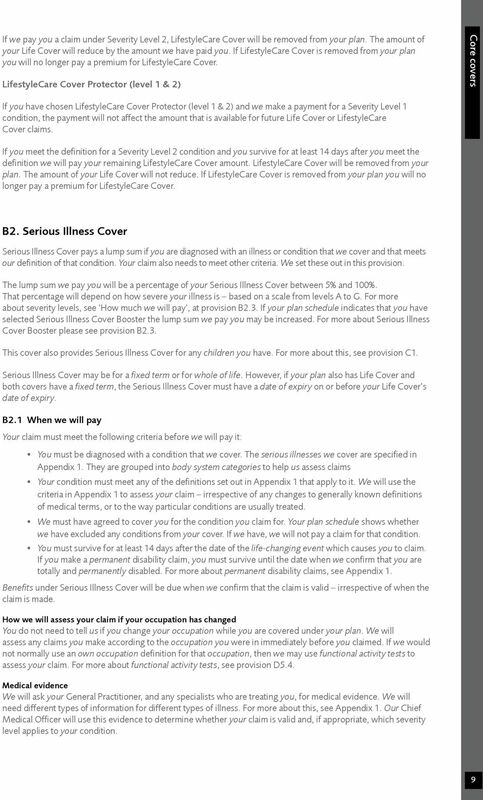 B1.5.5 How your cover continues after a claim for LifestyleCare Cover The way your cover continues after a claim will depend on whether you have chosen LifestyleCare Cover Protector. There are two types of LifestyleCare Cover Protector - LifestyleCare Cover Protector (level 1) and LifestyleCare Cover Protector (level 1 & 2).Your plan schedule will indicate whether you have selected LifestyleCare Cover Protector and if so which type. 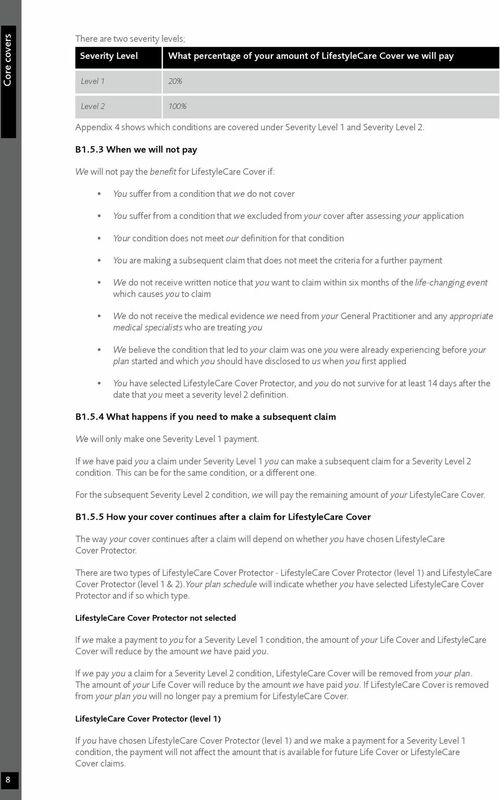 LifestyleCare Cover Protector not selected If we make a payment to you for a Severity Level 1 condition, the amount of your Life Cover and LifestyleCare Cover will reduce by the amount we have paid you. 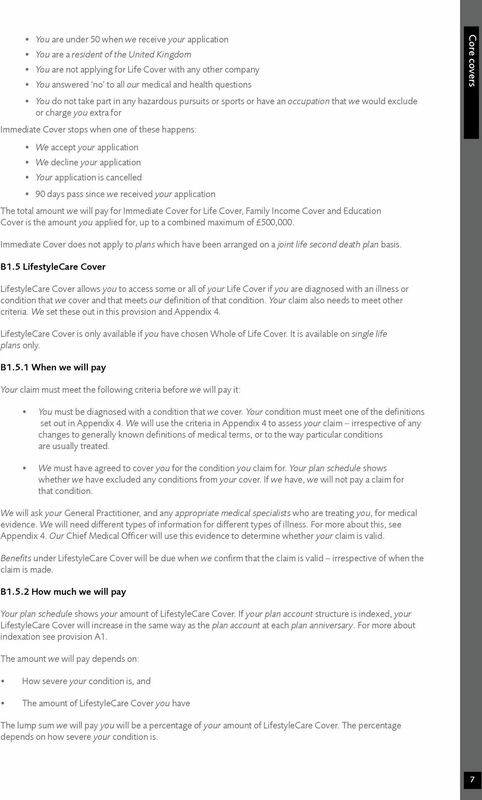 If we pay you a claim for a Severity Level 2 condition, LifestyleCare Cover will be removed from your plan. 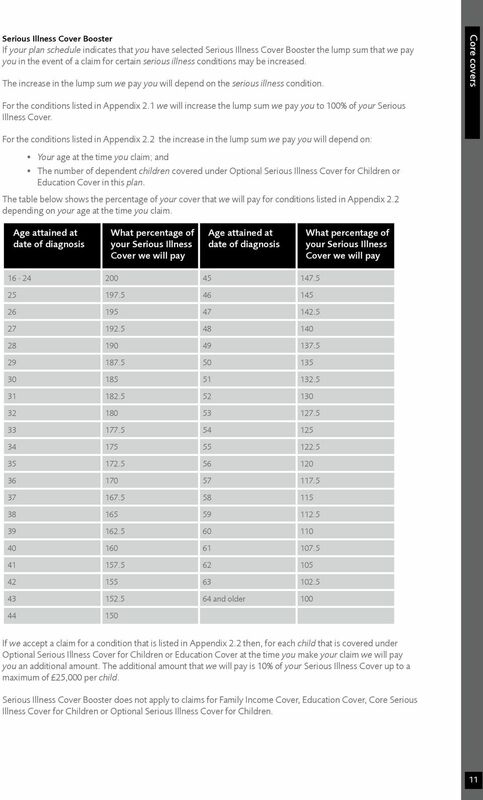 The amount of your Life Cover will reduce by the amount we have paid you. 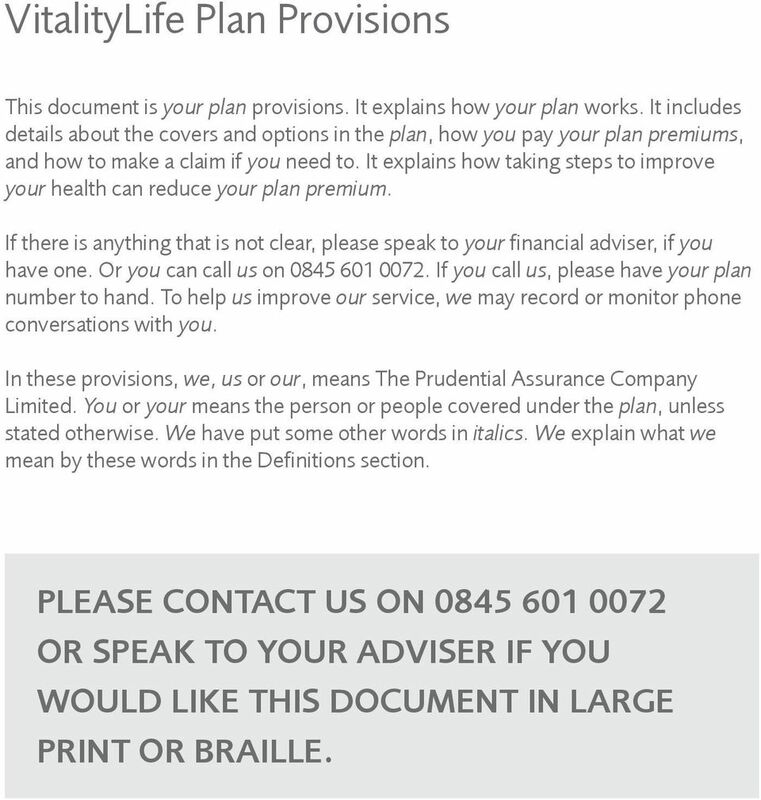 If LifestyleCare Cover is removed from your plan you will no longer pay a premium for LifestyleCare Cover. 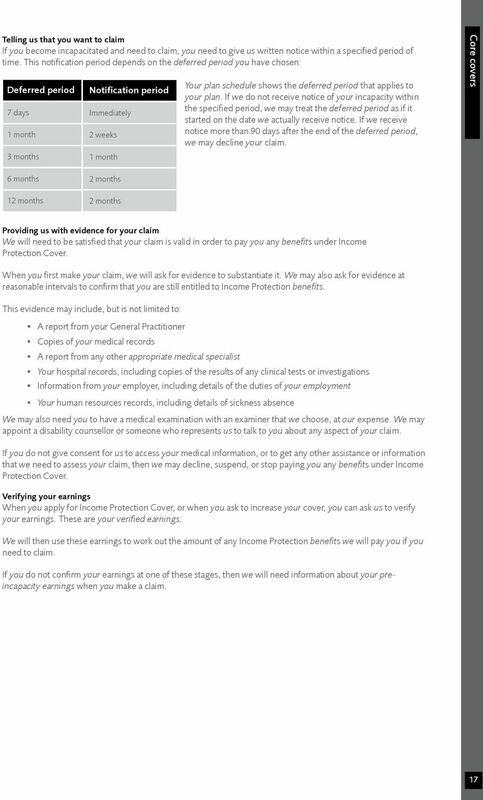 LifestyleCare Cover Protector (level 1) 8 If you have chosen LifestyleCare Cover Protector (level 1) and we make a payment for a Severity Level 1 condition, the payment will not affect the amount that is available for future Life Cover or LifestyleCare Cover claims. 16 Core covers 2. Subsequent permanent disability claims When we use the phrase permanent disability claims, we always mean claims under the body system category of permanent disability, not claims under Disability Cover. 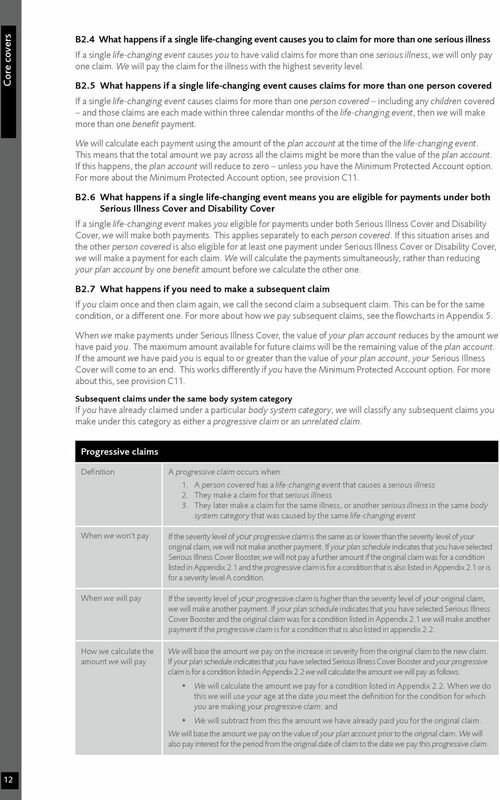 For more about Disability Cover, see provision C3. If you make a claim that is valid under both the permanent disability category and another body system category, we will treat this as a permanent disability claim. We will manage any subsequent claims on the basis that we have already paid a claim under the permanent disability category. If we have made a previous payment for a permanent disability claim, and your condition then progresses to a higher severity level within that category, we will: Pay an amount based on the increase in severity from the original claim to the new one. 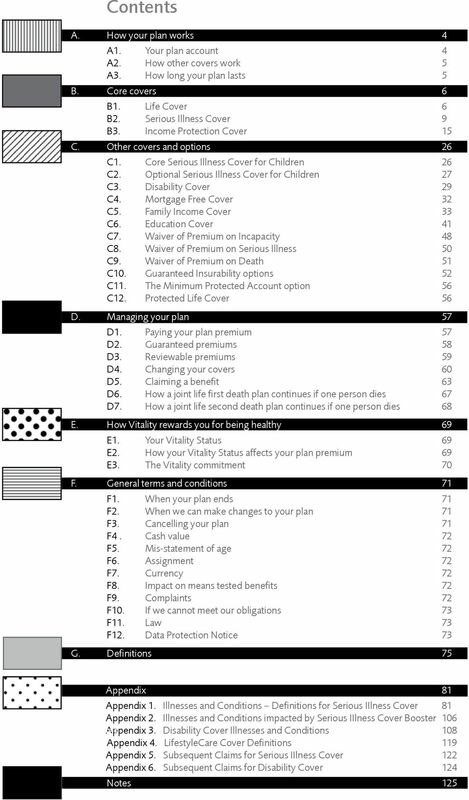 If your plan schedule indicates that you have selected Serious Illness Cover Booster and your claim is for a condition listed in Appendix 2 the amount we will pay will include any increase as a result of Serious Illness Cover Booster; and If we have made a previous payment under any body system category other than permanent disability, and your condition then progresses so it becomes valid under the permanent disability category, we will: Pay an amount based on any increase in severity from the original claim to the new one. If your plan schedule indicates that you have selected Serious Illness Cover Booster and your new claim is for a condition listed in Appendix 2 the amount we will pay will include any increase as a result of Serious Illness Cover Booster; and Manage any subsequent claims on the basis that this was a permanent disability claim The underlying cause of your permanent disability claim may be a condition or illness that is named under another body system category. We will treat your subsequent claim as a separate claim if, after making a permanent disability claim, you go on to make a claim either: Under the same body system category that the underlying cause of your permanent disability claim is listed under as long as this claim occurs more than 36 months after your permanent disability claim Under a different body system category irrespective of how long it has been since your permanent disability claim That means that we will treat your claim in the same way that we treat standard subsequent claims under a different body system category see above. However if you make an unrelated claim under the same body system category that the underlying cause of your permanent disability claim is listed under, and your subsequent claim occurs less than 36 months after your permanent disability claim, we will treat this as a standard subsequent claim. In this case, we will only pay the subsequent claim if it is of a higher severity level than your permanent disability claim. If we pay a severity A claim because you fail the relevant functional activity tests, we will not assess any further claims using these tests irrespective of which category of illness your claim is under. 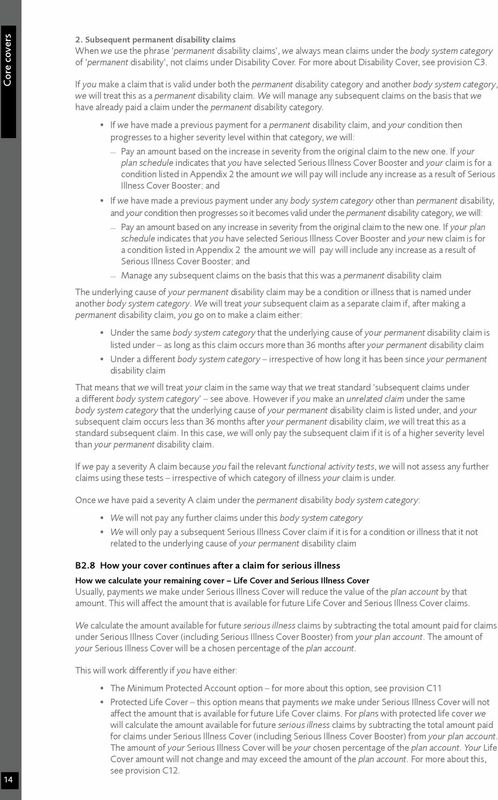 Once we have paid a severity A claim under the permanent disability body system category: We will not pay any further claims under this body system category We will only pay a subsequent Serious Illness Cover claim if it is for a condition or illness that it not related to the underlying cause of your permanent disability claim B2.8 How your cover continues after a claim for serious illness How we calculate your remaining cover Life Cover and Serious Illness Cover Usually, payments we make under Serious Illness Cover will reduce the value of the plan account by that amount. 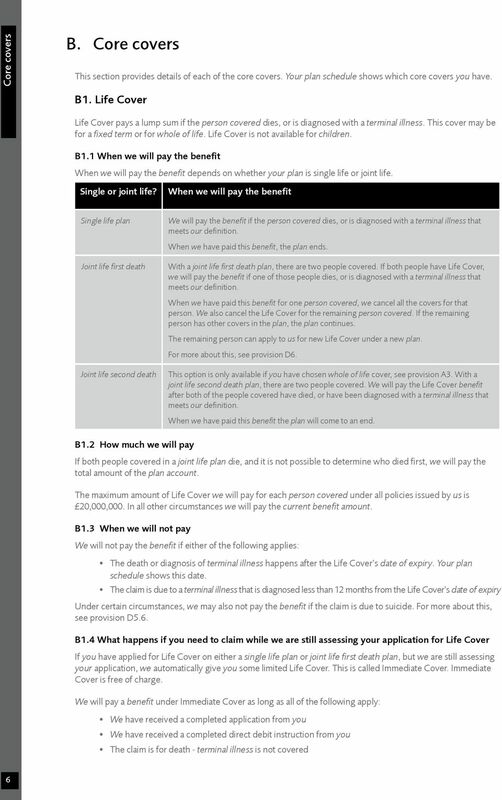 This will affect the amount that is available for future Life Cover and Serious Illness Cover claims. We calculate the amount available for future serious illness claims by subtracting the total amount paid for claims under Serious Illness Cover (including Serious Illness Cover Booster) from your plan account. 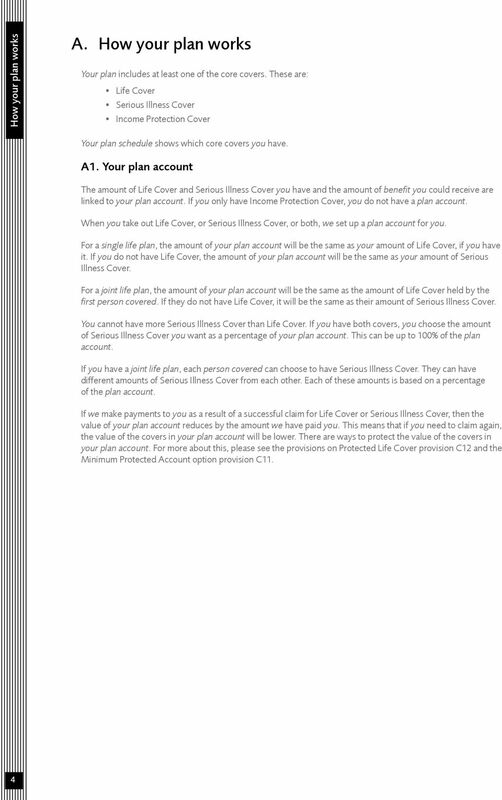 The amount of your Serious Illness Cover will be a chosen percentage of the plan account. 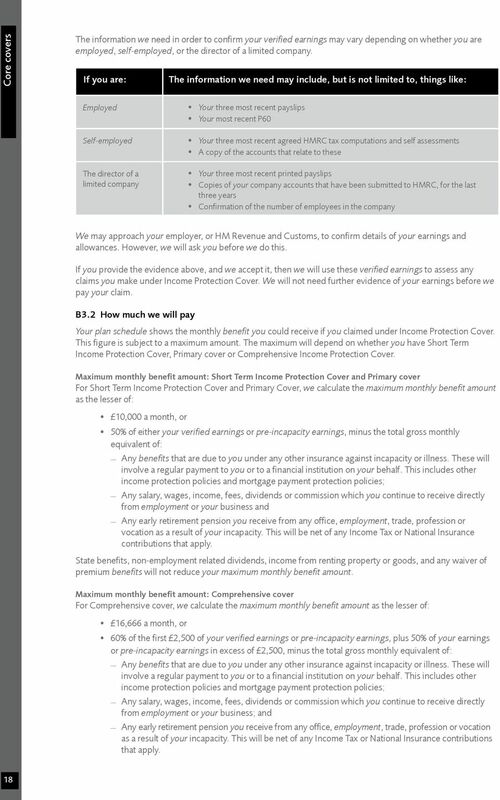 This will work differently if you have either: 14 The Minimum Protected Account option for more about this option, see provision C11 Protected Life Cover this option means that payments we make under Serious Illness Cover will not affect the amount that is available for future Life Cover claims. For plans with protected life cover we will calculate the amount available for future serious illness claims by subtracting the total amount paid for claims under Serious Illness Cover (including Serious Illness Cover Booster) from your plan account. The amount of your Serious Illness Cover will be your chosen percentage of the plan account. 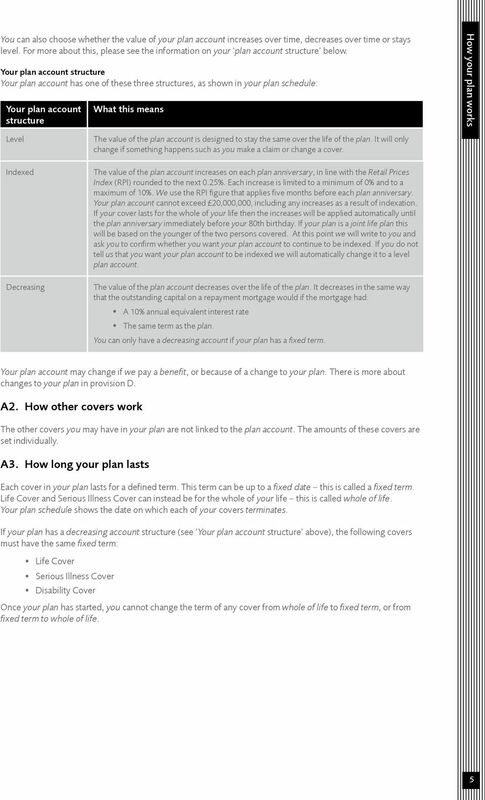 Your Life Cover amount will not change and may exceed the amount of the plan account. For more about this, see provision C12. For advisers only Friends Life Protect+ Income Protection. Income Protection cover. It s income protection. And more. For customers. Friends Life Protect+ Income Protection Cover. Income Protection Cover. It s income protection. And more. For customers Friends Life Protect+ Income Protection Cover. Income Protection Cover. It s income protection. And more. Priority Protection for Platform Investors Product Disclosure Statement Version 12, Issued 8 June 2013 aia.com.au Life s better with the right partner Who issues Priority Protection for Platform Investors? Information Guide Booklet Life Insurance This Information Guide booklet provides you with general information only. It will also help you to better understand any recommendations we have made for you. Product Options Guide A comprehensive guide to the options available on National Mutual Life Association (NMLA) Whole of Life, Endowment, Pure Endowment, Goldline, Flexipol and Link-Save policies and plans. Group Critical Illness Insurance Policy UGCIPOL/08/2008 GROUP CRITICAL ILLNESS INSURANCE POLICY This policy is issued by Unum Limited (called Unum in this policy) to the policyholder named in the schedule. START-UP INCOME PROTECTION TABLE OF CONTENTS. 2 When will Sovereign pay a benefit? 3 What amount will Sovereign pay for a benefit?